Superb quality painting guide and decals that should appeal if you have several builds to do or as a group buy. Should also appeal to decal collectors because of the attractive format. Kagero continues to release books on interesting WWII subject matter and the Messerschmitt Bf 109 covered in this particular booklet continues this trend. 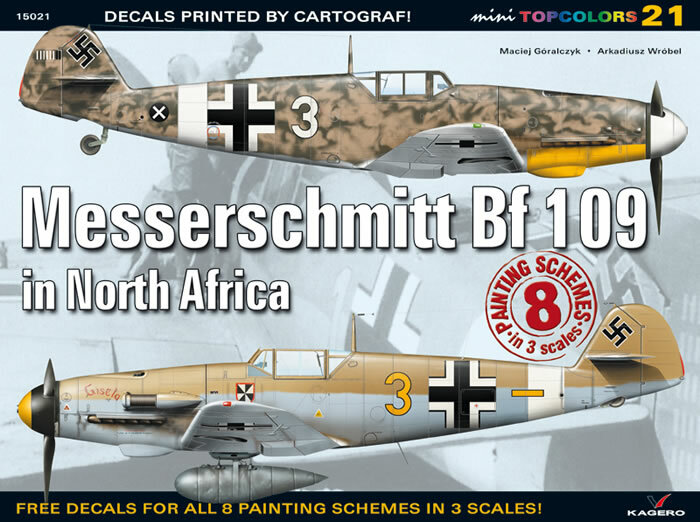 The 18 page book provides beautifully colour printed images of 8 different schemes for this aircraft as flown by the Luftwaffe in North Africa. The great thing about this book is that upper, lower and both side colour profiles are provided for each of the schemes and this is something that I wish armour kit manufacturers should take note of this feature. The colour prints are well detailed and I presume researched as an extra bonus decal are supplied for all eight schemes in 1/72, 1/48 and 1/32 scale. The only question for me is no decals are supplied for the national markings and you will have to source these from the kit you are building or elsewhere. In conclusion, a very nicely produced and printed reference book for those wishing to do something a bit different with your Bf109. Thanks to Kagero for the review sample.